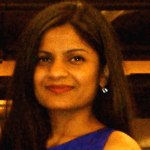 Meet Falguni Patel, a happy DAT Bootcamp customer who recently conquered the DAT. I’ve asked Falguni to share her DAT experience with us as the featured student of October. The most important advice that I can give to someone who is preparing for the DAT would be to give yourself enough time to learn and understand all of the material that you might be tested on. I took about two and a half months, roughly five to nine hours a day, to prepare for the exam. For the first month, I used a similar outline to the one that Ari has created to learn all of the material in the three sciences and the QR section. I used Chad’s videos to learn and solidify my understanding in General Chemistry, Organic Chemistry and QR. I made sure I understood the content in each video until I moved on to the next topic. Don’t be discouraged if you don’t understand everything the first time you come across it while reviewing. For some topics, especially in organic chemistry, I had to watch the videos up three times. I also wanted to mention that Bootcamp Biology Notes were extremely helpful for covering all of the content in Biology. I would say that ninety-five percent of all the questions that showed up on my DAT could have been answered after thoroughly learning these notes. That being said, I really feel that it is important to learn and understand the material in the science sections rather than just memorizing it. Even though this might require more time and effort, I promise, you will be much better off in the end. Out of all of the resources that I used to practice for the DAT, I would say that DAT Bootcamp was the most representative of the actual test. Other sources that I used before DAT Bootcamp predicted that my score would be around 18 AA which was extremely discouraging and demotivating. DAT Bootcamp helped me boost my confidence and helped me identify and strengthen my weak points. I really liked how with DAT Bootcamp I could take tests with each specific subject that I was struggling in. Also the explanations for each question are extremely helpful. After I took each test, I read through all of answers and made sure that I learned everything about the questions that I got wrong so I would never miss similar questions again. 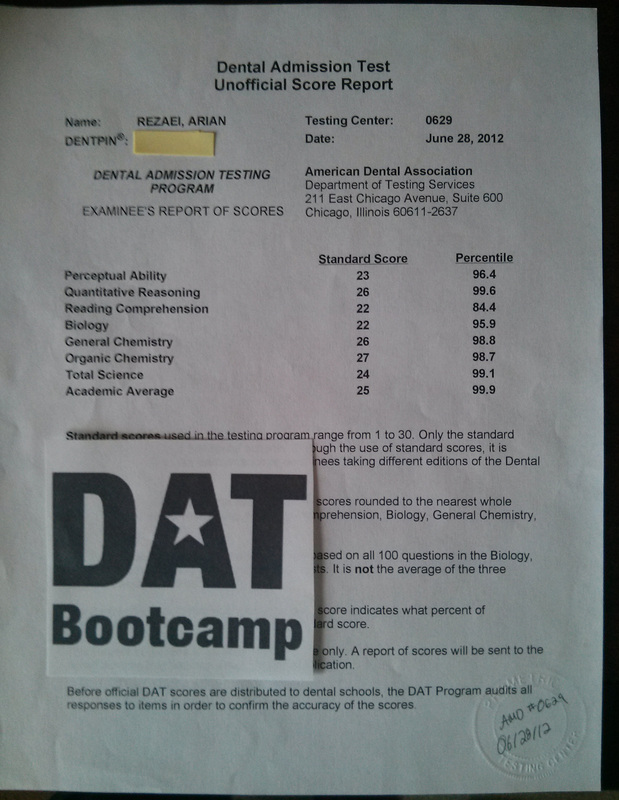 The scores that Bootcamp predicted were very close to the ones that I got from the actual DAT. I found the PAT and the QR section on DAT Bootcamp to be a little bit more challenging than the actual DAT. However, I am very glad I took the advice of many of the students here on Bootcamp to go through all of the PAT tests and take my time to learn all of the questions that I got wrong. I would say this is the best source when it comes to practicing the variety of questions that might show up on the PAT section. If I were to take the test again, I would spend more time studying for the QR section. I would spend more time on the questions that I got wrong on Bootcamp and learn them as I did for the science and the PAT sections. 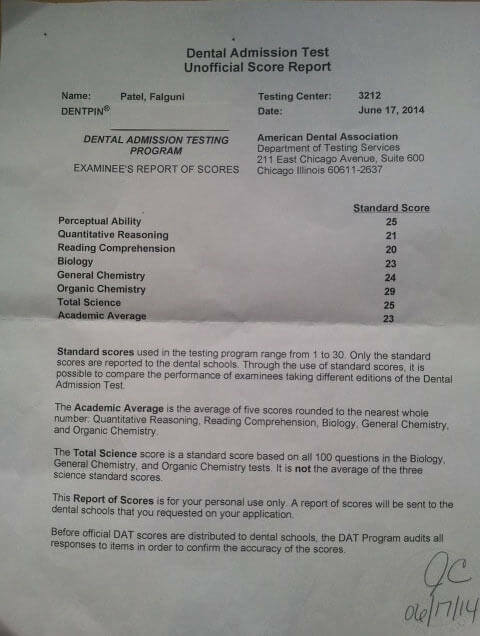 I was the most nervous about the RC section on the DAT because I could not figure out a strategy that worked for me on each of the practice tests I took. I was jumping from one strategy to the next because I thought since I wasn’t a fast reader I wouldn’t do well on this section. Next time I would just stick to one strategy that I felt comfortable with and take all of my practice tests using that strategy. If you have any questions, feel free to contact me on SDN. SDN username: khali. My score breakdown: 23 AA, 25 TS, 23 BIO, 24 GC, 29 OC, 20 RC, 21 QR, 25 PAT.